Patrick K Skinner’s new book, The Proverbs Project for Character Development In All Nations - Becoming Wiser & Reflecting a Right Light, ($23.99, paperback, 9781498455312; $9.99, e-book, 9781498455329) offers 48 short topical chapters for greater character focus and understanding Proverbs 19:8 in the Holman Christian Standard Bible – including the Fruit of the Spirit as seen in Proverbs. The author stresses that a lack of respect or self-love in one state has led more than 300 a year to die from heroin overdoses. A wise person is educated in the fullest sense: they know and accept God, they have a purpose for their lives and they serve others while relating in healthy ways. Proverbs defines healthy ways to relate to God and others. This book provides a tool to show how topical Proverbs could be of help in bringing character development in all the cultures/nations of the world. Each topical section gives a pithy or concise definition for the topical moral terms along with an introductory explanation. It asks thought questions to prepare the reader for the content, lists the verses to be read, asks questions for the reader to answer, and much, much more. Through reading and study plans for 9 months or a year, this book is ideal for schools, small groups or personal daily devotions. Patrick K Skinner graduated from the University of Northern Colorado (in Greeley) with a bachelors degree in organizational communications and public relations. He wrote Radio Scripts for Dr. Bill Bright's, “Here's Life Radio”. He was a youth pastor, an outreach pastor, a solo pastor and an assistant while gaining a Masters in Christian Ministries from Wheaton Grad School and a Master of Divinity degree from Garrett-Evangelical Theological Seminary. He has studied Proverbs for over 40 years and his rearranging Proverbs topically with thought questions and application questions is an outgrowth of his studies. He is the owner of Kind Hands Senior Care. Xulon Press, a division of Salem Media Group, is the world’s largest Christian self-publisher, with more than 15,000 titles published to date. 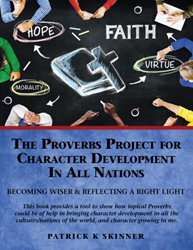 Retailers may order The Proverbs Project for Character Development In All Nations - Becoming Wiser & Reflecting a Right Light through Ingram Book Company and/or Spring Arbor Book Distributors. The book is available online through xulonpress.com/bookstore, amazon.com, and barnesandnoble.com.